“Barack Obama, yes we can! Stop this dirty pipeline plan!” The voices of over 40,000 others as passionate and purposeful as myself fed into the positive energy that flowed down Constitution Avenue to the President’s front door. On Sunday, Feb. 17, I joined tens of thousands in Washington, D.C. at the Forward on Climate Rally — the largest of its kind in U.S. history — to tell President Obama to stop the building of the Keystone XL Pipeline. After a sleepy six-hour bus ride, I reached the national mall alongside hundreds of other Ithacans, and we were met with an indescribable scene. Beside the massive crowd, the Washington monument seemed small and insignificant. Polar bears, musicians with giant drums, a 20-foot-tall dancing statue of liberty and folks of all ages wielding cardboard signs and megaphones gathered to listen to politicians, activists and indigenous people speak before taking to the streets. We chanted and marched to the White House, where the crowd’s immensity was meant to indicate to President Obama that he could no longer ignore what the people know is right. For Alyce Daubenspeck, a junior environmental studies major, participation in the Forward on Climate rally was based on an urgent need to act. Daubenspeck was a passenger on one of the six student busses (in addition to the four Ithaca community busses) that arrived in DC earlier that weekend. Her motivation to take action and be heard stems from her knowledge of the widespread political, economic, and social harms that will inevitably come from the Keystone XL pipeline’s construction. The KXL pipeline is a proposed approximately 1,700 mile pipeline, to be built by TransCanada, that will stretch from Alberta, Canada to oil refineries on the coast of Texas. It would be an extension of the original Keystone Pipeline, which has been operation since 2010. The KXL project calls for this 1,700 miles of pipeline (an addition to the existing pipeline) to be put in the ground, connecting from Alberta to the existing pipeline in Nebraska, and from an already placed pipeline in Oklahoma down to Texas. President Obama plays a unique roll in the potential construction and ultimate fate of the KXL: he has the power to either approve or deny TransCanada’s project. Speakers at the start of the rally, as well as many participants’ signs and chants, directly addressed Obama. Allison Currier, a junior environmental studies student, saw the rally as a chance to say, “Obama, we want to hold you to your commitment to mitigating climate change in this country, so we would like you to stop the Keystone XL pipeline once and for all and help us create a future that we would like to be a part of.” During the rally, however, President Obama wasn’t there to hear the message. In fact, he was in Texas, playing golf with Tiger Woods and Jim Crane, a Texas businessman with strong ties to big oil. Despite his ignorance of a 40,000-person rally directed at him, many of us in the U.S. and Canada hope that President Obama will not ignore the facts. TransCanada intends for the KXL to be up and running by 2015, pumping over 700,000 barrels per day of tar sands oil. Tar sands oil is a thick, tar-like fossil fuel, the extraction and refining of which requires more labor, energy, and water, destroys more natural land, emits more carbon dioxide and in the end produces even less fuel than the extraction and refining of regular crude oil. TransCanada boasts on its website that the corporation “is a leader in the responsible development and reliable operation of North American energy infrastructure,” assuring the reader that the KXL will be the safest pipeline yet to go into the ground. They say nothing of the unique qualities of tar sands oil that will cause false pressure alarms indicating nonexistent leaks and a probable increase of real leaks that will be unusually difficult to detect or clean up. There is widespread national and international resistance to the KXL pipeline based not only on the environmental dangers of air, water, and land pollution, but also on the human rights violations and economic follies that will likely occur. Many indigenous people have taken to the movement against the KXL, as their land has been seized and poisoned without consent or compensation. Two thousand miles of land cannot be dug up without disturbing or completely destroying homes and entire communities, and people recognize these impending catastrophic results. 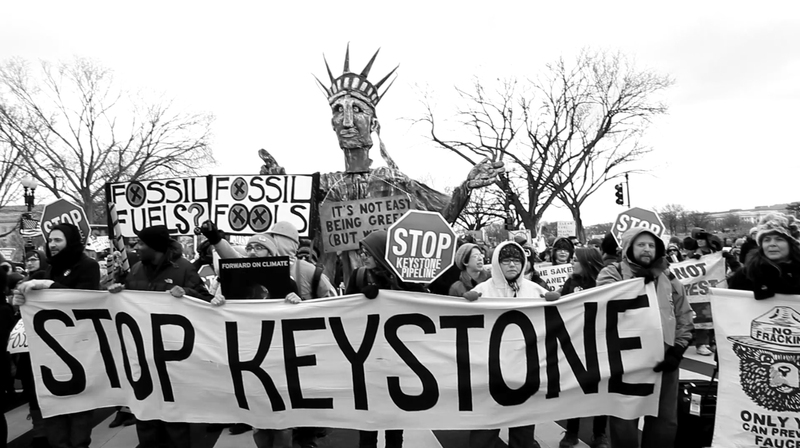 The irreversible environmental and community impacts, along with a resistance to the transnational economic dominance of the fossil fuel industry, have fueled the fire of opposition to the KXL. Kelsey Erikson, a senior natural resources student and member of KyotoNOW! at Cornell, believes the KXL is awful no matter which way you look at it. 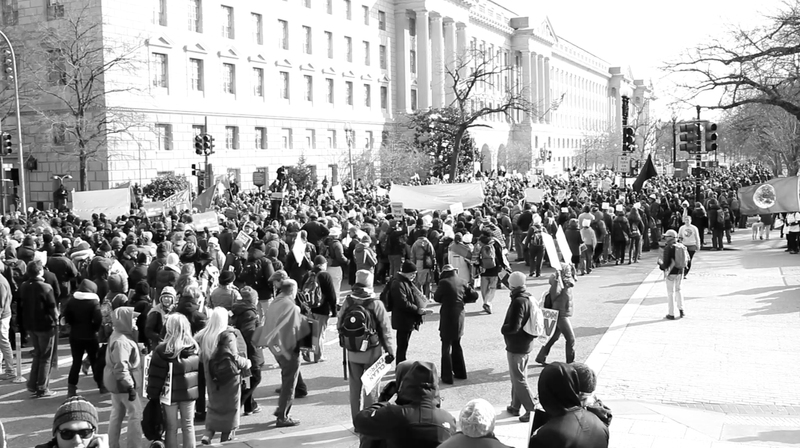 Erikson played a significant role in gathering student support for the Forward on Climate rally, by organizing busses and working on recruitment through social media and other outlets, along with Currier and other IC students. The rally was not only nationally significant for the sheer number of people who travelled to Washington, D.C.; it was almost more significant locally, in that the many compartmentalized communities around Ithaca united in solidarity. Students from TC3, local high schools, Cornell and Ithaca College, as well as community members from Ithaca and beyond, took the trip in ten busses and countless packed cars. “It’s this unifying moment where we’re passionate and we’re excited amped up and we’re ready to create change and show our direct democracy,” Currier said. The masses of students that took part in the rally, and that consciously and effectively worked together, shows that we are ready to step up and stop those in generations above us from further degrading our planet. Rebecca Billings is a junior politics major who is a fan of olive oil. Email her at rbillin1[at]ithaca.edu.